Traders do not take risks because they are unafraid of losing money. If they do not take the risk, then they will not get rewards associated with that threat. Risk is one of the most crucial factors that drive the share markets. Transactions amounting to billions and trillions of dollar take place in share bazaars, forex markets, and other financial markets across the globe every day. Large volumes of stocks and foreign exchange currencies are traded each day which generates volatility in the market and allows traders to book a profit. All of this is possible only due to the risk-taking ability of traders. Many people are afraid of taking risks because when they think of risk, they associate it with a negative connotation. They are more fearful of the downside because they feel losses more heavily than gains. Risk is a very critical factor and cannot be quantified, but it can lead to great rewards in intraday trading and long-term investments. If there were no such parameter as risk, then the following would happen. Market stagnation: If traders are not willing to take risks, then the volume of trades generated will reduce drastically. This will lead to decreased volatility or fluctuation in the market. Due to this, it would become difficult for traders to find an appropriate number of buyers and sellers in the markets and as a result, the markets will stagnate. In this situation, traders will find it difficult to make profits and may even decide to quit trading. Missing out on good opportunities: Traders do not take risks because they are unafraid of losing money. If they do not take the risk, then they will not get the rewards associated with that threat. 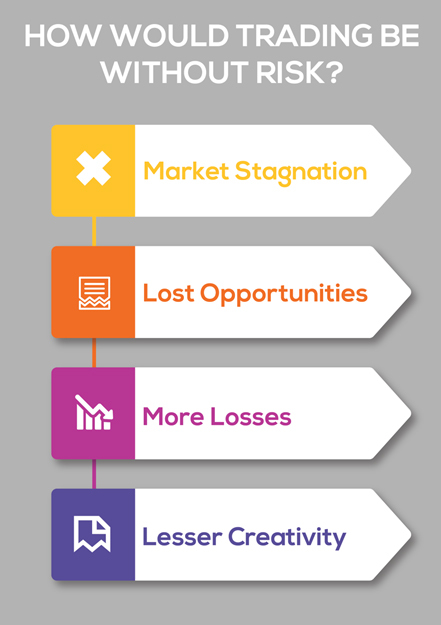 More losses: A trader who is reluctant to take risks will immediately close his open positions when it starts to make a loss out of the fear of losing more money. On the other hand, a trader who takes a risk will wait for the stock price of the company to bounce back and book profits on the trade. The latter are more confident about their analysis than the former. This is the reason they are willing to take more risk. Less creativity: Technical and fundamental analyses are the backbone of trading. Traders who have mastered both forms of analyses find it easy to make profits. Performing analyses is an art and not a science. That is why it requires rigorous practice and good creativity on part of the traders. Combining various technical analysis charts and tools to predict market trends demands more creativity. Traders who prefer to take more risk are more creative than the ones who are afraid to take it. Creative people tend to make a more significant number of high-return investments.